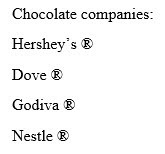 If you've accidentally used the wrong symbol through your document and need to replace it with a different symbol, it may be difficult. With the Find and Replace dialog box open, you can't access Insert, Symbol. You could enter the symbol's shortcut key, however not all symbols are assigned a shortcut. Here's how to work around this problem. This process also works in Word 2013 & 2010. 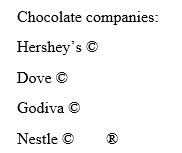 Step 1:Somewhere in the document, insert the symbol that will replace the incorrect symbols. Format the symbol to match the surrounding font, size, etc. Step 2:Under the Home tab and Editing group, click the Replace button. Step 3:With the Find and Replace box open, highlight the symbol in the document that you need to replace. Press [Ctrl] + [C]. 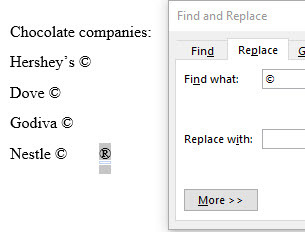 Step 4:Click in the Find what: text box of the Find and Replace window. Press [Ctrl] + [V].Step 5:With the Find and Replace box still open, highlight the symbol in the document that will replace the other symbols. Press [Ctrl] + [C]. 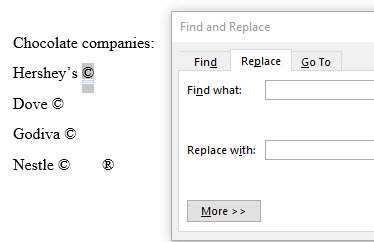 Step 6:Click in the Replace with: text box of the Find and Replace window. Press [Ctrl] + [V]. Click the Replace All button. Step 8:The incorrect symbols will be replaced with the correct one. You may close out of the Find and Replace window and delete the extra symbol.